Acura of Limerick is your friendly Acura showroom with the best selection of Acura cars for sale in town. Today we’re highlighting the impressive 2018 Acura TLX and you’ll quickly see what makes this vehicle to exceptional once you hear some more about it! The 2018 Acura TLX delivers an amazing driving experience thanks to the impressive performance from its featured 2.4-liter four cylinder engine that gets 206 horsepower when paired with the eight-speed automatic transmission. Naturally, the Acura brand hasn’t slouched on the style front with the 2018 Acura TLX either. This is evidenced by its aesthetic of strength and substance throughout the vehicle with nice touches like chrome trim and clear coat paint. Things get even better once we get inside the 2018 Acura TLX! The Acura brand is well known for their stellar safety standards and the longevity of their models. 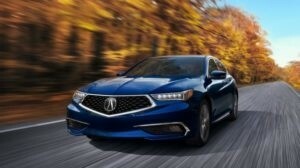 In the 2018 Acura TLX, we see a continued example of this hard-earned reputation. Some of the many safety features available to you include side impact beams, a full array of airbags, a rear back-up camera, and a collision mitigation braking system. The 2018 Acura TLX also offers a wide variety of comfort and entertainment amenities to make you look forward to being behind the wheel time and time again. Things like a premium 7-speaker sound system, Apple CarPlay® or Android Auto®, push button start, and heated front seats are just a sample of what you can call yours! Join us at our Acura car dealership near King of Prussia, PA today to test drive the 2018 Acura TLX and experience all of its greatness! We conveniently located at 77 Autopark Blvd and our welcoming sales staff eagerly awaits your arrival. We look forward to serving you!